My most recent article focused on the high levels of production in the United States, and how it’s great for the economy. In the United States, the consumer is the heart of the economy. So, when people are spending more money, the economy is likely to be doing well. If nobody is spending, businesses fail, people lose their jobs and so on. It has a domino effect that has sent us into the Great Depression of the 1930s and the Great Recession of 2007-2009. But we’re in an economy right now where businesses and consumers (who drive two-thirds of the economy) are thriving. People are getting new jobs, making more money and having a positive impact on our economy. Here are a few important indicators that reflect the overall bullish outlook on the United States economy. 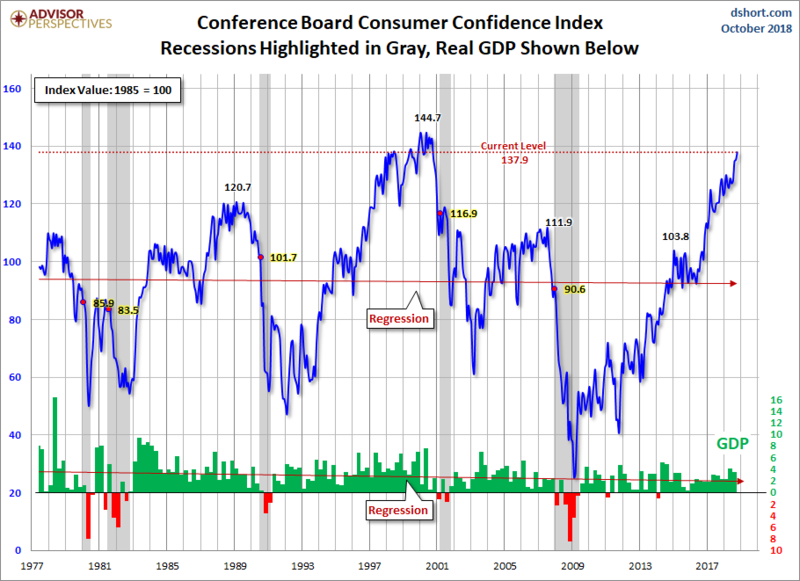 My favorite way to measure the level of consumer activity is the Conference Board Consumer Confidence Index. Every month, about 5,000 U.S. households take the Conference Board’s survey. This measures consumers’ opinions of current and future business conditions and employment. Of course, it could be argued that the index doesn’t take enough people into account. But it’s been a reliable tool for gauging the economy since it began in 1970, as you can see below. The most recent two readings of the index have been 138.4 and 137.9 (for September and October). These are amazingly optimistic levels we’re seeing from consumers. We haven’t seen back-to-back months that strong since September and October of 2000. Increasing consumer confidence and spending doesn’t necessarily mean anything. That spending could be done with too much credit. Obviously, if a country is full of people spending a ton of money on things they can’t pay for, that’s bad. However, that hasn’t been the case. 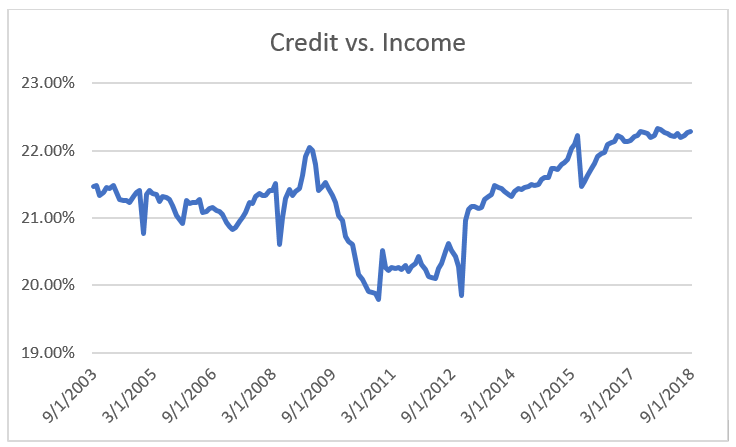 Total consumer credit has gone up at a similar rate to income. Over the past 15 years, the amount of consumer credit has stayed at about 20% to 22% of total income. This includes credit such as auto loans, credit card debt and personal loans. The dip during the 2008 financial crisis was due to the hesitation of banks to give out new loans, as well as new regulations. After that, there was a sharp rise from 2013-2015, but it’s leveled out recently and remains steady. That stabilization is important when you consider how consumers have recently been spending more money. It shows that they’ve been able to do so without tapping into more of their income. So, not only are people bullish about the economy, but they’re also doing their part to keep it stable by not being reckless with their money. There’s a lot of negativity surrounding debt right now, so let’s dig further into that. This can be done by looking at delinquency rates. The delinquency rate is the percentage of outstanding loans that have at least one payment that’s 30 or more days late. When a lot of people can’t pay their bills, the delinquency rate goes up. That’s a bad sign. About 83% of total consumer debt in the United States is made up of mortgages, auto loans and credit card debt. And even though each one of these forms of debt is growing, the delinquency rates are extremely low. Here, you can see the decline of delinquencies for credit card and mortgage loans. Clearly, people are in a much better financial situation than they were pre-2008. 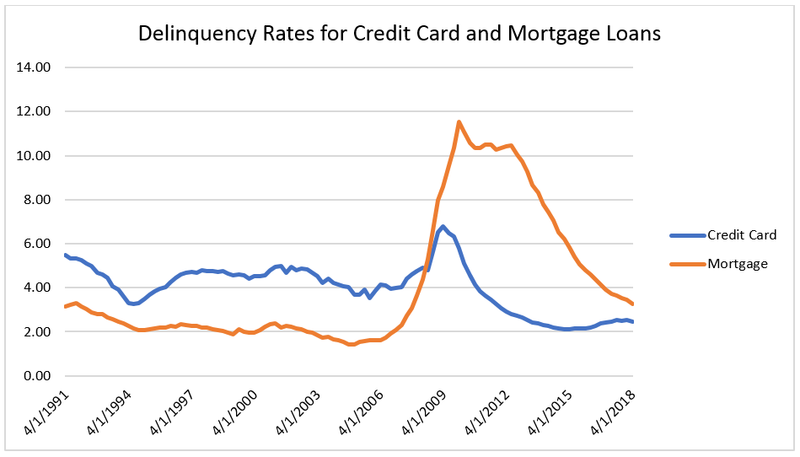 Credit card debt delinquency rates are near their lowest point in decades, and mortgage delinquency rates have been in free fall since 2009. The auto loan market is looking positive as well. This shows that only 14 out of every 1,000 auto loans has a delinquent payment outstanding. 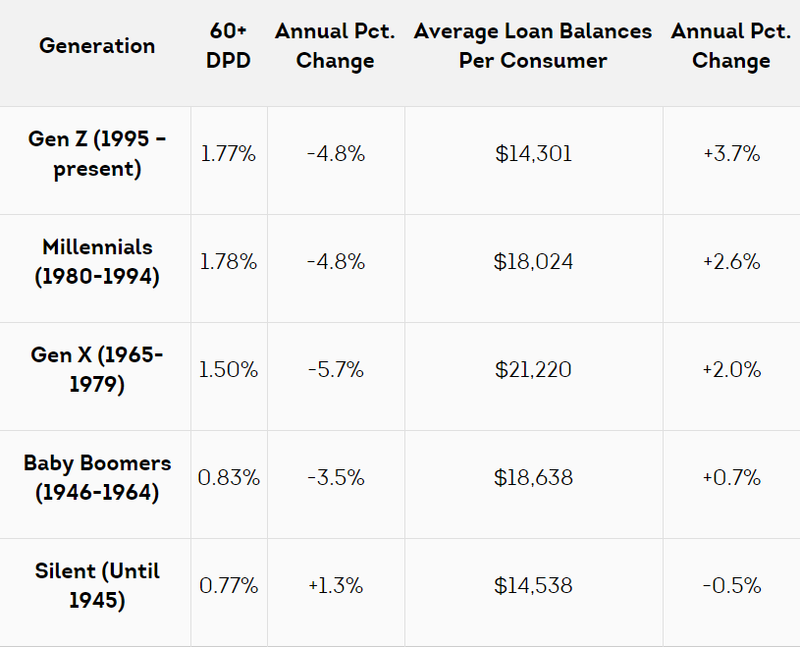 The rate has also improved over the past year for almost all generations. The lone exception is the Silent Generation, who make up less than 8% of the population. Some of this decline is due to the fact that interest rates came down and have stayed at record-low levels for years. However, rates have now gone up by about 2% over the past two years. Meanwhile, credit card delinquencies have stabilized, and auto and mortgage delinquencies have continued to go down. All of this is extremely positive for the economy, as consumers have been able to spend money without putting their finances in danger. Lastly, I’d like to emphasize some of the positive things we’ve heard straight from management. The most recent earnings season gives us firsthand insight into current business conditions. For insight into consumer-related activity, we can look to Target, Walmart and Home Depot. These companies are the largest in the world in their industries, and they’ve brought in a combined $692 billion in sales over the past year. Comments from management are one of the most reliable gauges on the current state of business. Clearly, these executives have a firsthand view of consumer tendencies. But they are also typically conservative with their comments to avoid misleading shareholders. Especially big companies like the three I mentioned above. For example, if Target went out and said positive things about 2019, and then we had a recession soon after, it would lose a lot of investors. So until we see a definitive slowdown in spending, or debt reaching a point where people can’t pay it, there’s no reason to expect a recession anytime soon.